You are here: REDWOLF > Home > News >News Detail - G&G GR16-R4 Carbine and GR16 Carbine have arrived now!! 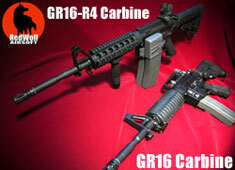 G&G FULL METAL GR16-R4 Carbine and GR16 Carbine have arrived! G&G products are renowned for their high quality construction and refined finish. Targeted for the Japanese market, all G&G products meet Japanese quality specifications. We have tested the new G&G gearbox and happyily report that this is one of the most reliable full metal AEGs out of the market today, with full Tokyo Marui and Systema compatibility in all parts. These are high quality rifles that also have a high speed / torque motor to reduce trigger pull delay. Shooting performance is identical to the Marui M4, yet the full metal body and STEEL barrel add a much more realistic feel to the gun. Custom LE 6 position stock and a standard high capacity magazine make these guns excellent value for money! Click here!